Keeper Aiofe Bromley is congratulated by team-mate Chanade Henderson after her shoot-out heroics. Peterborough Northern Star Ladies reached the Northants County Cup final yesterday (February 15) . . . but only just. 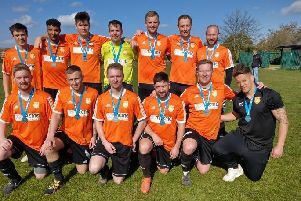 The city side nearly became victims of a giant-killing act as they were taken to a penalty shoot-out by underdogs Raunds Town in a thrilling semi-final at the Mick George Arena. Raunds had been beaten 8-2 by Star in a league match just a couple of months ago but on this occasion Star found them much more difficult to break down. Star boss Steve Iredale said: “We came up against a team that came with one thing on their mind and that was to defend with 10 players behind the ball from the very first whistle. Five minutes into the second half, however, Star managed to find a way through when Vicky Gallagher slotted home to even the scores. But despite intense pressure Star were unable to add to their tally. Raunds made three goal-line clearances and a 25-yard belter from Jodie Bartle hit the post and it finished all square after 90 minutes. Star keeper Aiofe Bromley then became the heroine in the shoot-out saving two of the Raunds spot-kicks before midfielder Abbey Young slotted home Star’s fifth penalty to give her side a 4-2 win and a place in the final for the second time in three seasons. Star will now meet Northamptonshire-based Burton Park Wanderers in the final.